The third book by Yuval N. Harari, historian and author of the bestselling books “Sapiens, a Brief History of Humankind” and “Homo Deus, a Brief History of Tomorrow”, was published in August this year. 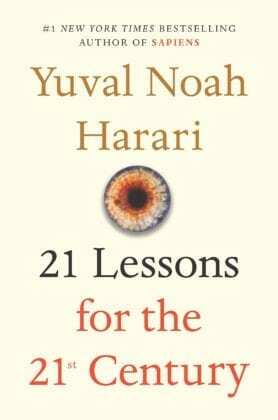 Whereas Harari’s former works were focused on the past of humankind or toward its future, “21 Lessons for the 21st Century” investigates the most pressing issues of our times. Professor Harari finds 21 topics which embody the plethora of uncertainties surrounding our present and immediate future, and then, with the past history of our specie well in mind, suggests his thought-provoking vision about them. His unique timeliness is due to his unparalleled ability to reframe the past in order to investigate the present. In the second lesson, “Work,” Harari talks about automation, Artificial Intelligence, machine learning and the impact they will have on the labor market and society as a whole. In order to avoid collapse, deep change is required, a true renovation of our social models. And Universal Basic Income (UBI) may be one of the answers. It is unclear how the labor market will look in the long run. What is certain is that it is undergoing change. The advances in Information Technology (IT), machine learning and robotics will bring on a wave of automation, the author said. But it is not the first time in human history that society measures itself with automation, as we already faced similar events, most notably with the industrial revolution. And the fear of mass unemployment was proven unjustified. Thus, in Harari opinion, we have to ask whether this time will be different. Are our concerns about a jobless future legitimate? Or are we exaggerating the magnitude of the phenomena? Do we incur in the risk to act like modern luddites? The situation of the nineteenth century was different, Harari mantains. When industrialization hit, it is true that many jobs were appropriated by machines, but at the same times many new jobs were created and the quality of life was profoundly improved. As humans have two kinds of abilities, physical and cognitive, during the industrial revolution machines competed for only one share of the things humans could do, the physical one. When jobs in the industrial or agricultural sectors were automated, they opened the door to jobs requiring a cognitive skill set, the category of jobs we commonly associate with the third sector. What is happening is due to the fact that the AI revolution is not just embodied by the evolution of computers, becoming faster and more “intelligent,” but it’s closely related to other fields; the momentum of the revolution is shouldered by advances in biology and social sciences, Harari said. As more is understood of the underlying biological mechanisms controlling the emotive dynamics of humans, the more computers become able to analyze human behavior, to foresee human decisions and to take their place in a number of jobs. Advances in neuroscience and behavioral economics revealed that our choices do not depend on free will as much as on the calculations of the neurons in our brains, assessing probabilities at enormous speed, the author writes. Human intuition can be considered “hacked” as it was revealed to consist of pattern recognition, the ability to identify recurring patterns and use them to create models and make predictions. And AI can become very good at pattern recognition. If intuition is no more than assessment of probabilities and creation of predictive models, it should not come as a surprise that machines can take our place, given that our very functioning is imperfect and prone to errors: it relies on circuits created through the evolution of our specie, in contexts far in time and place from those in which we try to apply them –the savannah is nothing like today’s cities. Automation will not impact the entirety of fields, as some jobs are more susceptible to it than others, Harari writes. Particularly, jobs based on repetition, and following linear dynamics, will be more prone to automation. Multifaceted activities and unexpected scenarios are still a no-go zone for machines. Where the jobs of many doctors, requiring diagnostics and prescriptions could be expected to be a no-brainer for AI, the job of nurses would prove more problematic, requiring a mix of personal relationships and physical activity. Caretaking will probably be one of the most difficult task to automate, and could very well be the activity in which most humans will be occupied in the future, Harari suggests. Harari sustains that talking about a jobless future is premature, as automation will allow for more time and resources to be invested in study and research, with the potential to develop new treatments, drugs and deepen our understanding of the biological world. Furthermore, there will be a place for human-machine cooperation. Drones require many operators to work them, driverless vehicles require some form of supervision, cyber security and maintenance will be needed, but as we advance in technology the requirement for human intervention will become less stringent. But the jobs we are talking about are knowledge intensive, which means that even if they were numerically sufficient to limit unemployment (and they are not), we would nonetheless be left with the problem of unemployment due to under-specialization. In Harari’s opinion, one of the main differences of this technological revolution from the precedent is the degree to which professions were interchangeable. When jobs were less specialized, it was easier to switch from one profession to an another, but jobs that machines will not be able to do are going to require a high degree of specialization and years of study. This alignment will pose the risk of facing “the worst of both worlds”: mass unemployment and lack of qualified workers. And professor Harari notices how, even for those who are able to pursue a new career, the rapid pace of technological advance could make it obsolete in the matter of years. Not just professional development, but jumping from a field of study to an another will become the norm in a volatile job market, as the ephemeralization of work will make the idea of formation for a career as an one-off effort laughable. This should also be seen as an emotive cost for workers, the uncertainty causing a great strain in terms of mental health: if the unstable job market of the first decades of the twenty-first century produced an explosion of work-induced stress, mental resilience to change will be among the factors skimming the employment market. Looking back at the history of the industrial revolution, Harari considers how the new social conditions – great industrial metropolis and the dynamic nature of the arising economic markets – could not be accommodated by the existing political, economic and social models. Institutions such as religion, monarchy and feudalism were no longer apt to direct society. A whole century of social unrest followed before an equilibrium was found, with liberal democracies, fascist regimes and communist regimes on the playing field. What automation will bring rests in the realm of speculation, but Harari highlights how there is potential for great societal disruption, and we cannot afford complacency at the risky of bloody revolutions following systemic unemployment, given the great destructive power of modern warfare. Universal Basic Income (UBI) is one of the potential models that could respond to the technological and economical revolution we are expecting, Harari says. Its focus on the provision of means to satisfy basic needs is aligned with the necessary imperative of protecting people and not jobs, and could help to preserve the social status and self-worth of humans in a work-lacking future. Financed through progressive taxation, an UBI would act as a redistributive instrument in a world which sees growing polarization between the riches and the poor. An alternative idea, in the author’s opinion, is to rethink the meaning of work by taking into account the education of children and caretaking. Considering caring for others as work which should deserve a monetary compensation would help foster informal safety nets and strengthen communities. Doing so would help preserve the social fabric which could be disrupted by the upcoming AI revolution. Since it would fall upon governments to pay for such activities, this would not ultimately differ from UBI. Given that UBI could prove itself a valuable instrument to build a model for the society of the future, Harari calls for a better investigation of its possible application; that is, minimum and universal need to be defined. In a globalized world, where market and industries are interconnected and delocalization is the norm, the meaning of universal need to be ascertained. UBI experiments have always been of reduced geographical extension, and it is usually thought, in its largest declinations, as a country specific measure. But if it was applied at the national level, its locality would create a problem, as its redistributive effects would not affect those who need it the most. As the wealth appropriated through the world is concentrated in a few nations, a progressive taxation used to fund UBI would then redistribute wealth not globally, but to a lucky minority. Ideally, a global government could work out a functioning form of global UBI, but at the cost of its feasibility: redistributing wealth globally could very well prove impossible, in the opinion of professor Harari. If a minimum income has to be enough to accommodate one’s basic needs, we have to decide which needs are basic, and this could prove to be a difficult exercise: homo sapiens needs food and water to survive, everything else may be considered superfluous, the author says. Today we may consider also shelter, healthcare and instruction as basic needs, but there is no certainty about what is going to be included among them in the future. Human needs depend very much on expectations, they are far from being objective, and so the definition of minimum will remain a fluid concept as society changes through time, Harari forecasts. This means that the mere access to an income will not per se suffice in making people happy, but UBI will have to be integrated with activities which makes people satisfied, from civic engagement to sport. Harari suggests that his country of origin, Israel, could be thought of as a testing field for a satisfying life in a post-work world. There, half of the ultra-Orthodox Jews do not work, but spend their lives praying and studying the sacred tests, while receiving government subsidies and a share of free services. They derive their happiness from the strong ties they develop with the community they live in and from the fulfillment gained via their investment in religion, Harari mantains. Even as they are looked at with contempt from the laic citizens of Israel, which see them as freeloaders, their example may very well provide a model for the society of the future: life will be spent in the search for purpose, which could be found through the development of a strong sense of community and by investing time studying and in the construction of social relationships. Those activities, combined with the economic safety net provide by UBI, can maybe provide a picture of the society of tomorrow. Government are not going to solve this (or any other) problem. We need a clean, transparent distribution of primary money (Cantillon effect) directly to the people (who created the wealth is the 1st place). Government is not “we the people“; it is a separate entity like General Motors or the Vatican. While GM sells cars, and the Vatican sells hope, the government uses extortion to acquire income. Even in those agencies that do provide a service, there is only a thin blue line along the bottom that actually does anything useful. Piled on top are layers upon layers of bureaucrats gorging on tax, while making life miserable for that thin blue line, and the rest of us. For eg. only about a third of the tax money assigned gets to the nurses, teachers, works, etc., most being lost in the bureaucracies. Bureaucrats are motivated by pensions and promotions leading to ever more layers of managers and administrators extorting tax, fees, licenses, from us and generally making our lives miserable.